It boggles the mind. It really does. These signs appeared on our bike lanes over the past couple of days, when you're approaching a side street. 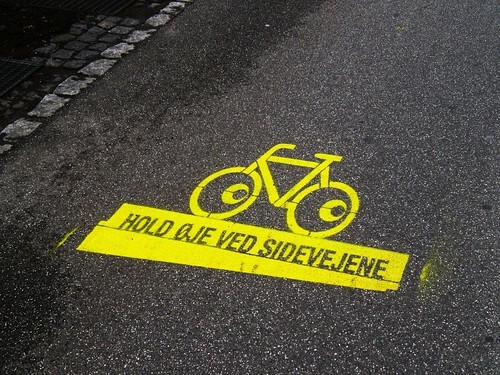 It reads, "Keep your eye on the side streets." It's the latest car-friendly campaign from auto industry's favourite national traffic safety council - Rådet for Sikkertrafik. They've been protecting the car industry for decades and they're at it again. Upon seeing the spray-painted sign I rolled up to the side street and looked for a corresponding warning sign for the motorists approaching from this direction. Nothing. No brightly-coloured signs or posters or painted warning on the street reading, "Watch out for cyclists and pedestrians!" 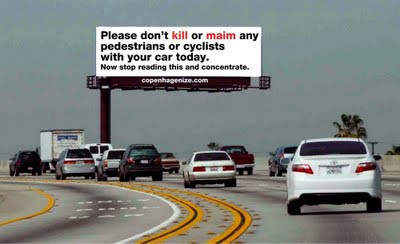 No in your face billboard warning them of the fact that it's cars, driven by motorists, that kill. Classic Ignoring the Bull from people who should know better. Here's a previous post about behavourial campaign challenges. If the warnings on the bike lanes HAD corresponding messages to the motorists on the side streets, it may actually make sense. But they don't. The paradigm shift in this nation is becoming more and more defined. Less bicycle-friendly. More car-centric. At the very least, here are some bad examples that we all can learn from. Now if only we had a cyclist organisation that could counter the constant attacks on our liveable cities and our bicycle culture. If only.